This month I’ll turn my attention to an article I found online researching the effects of acupuncture for the treatment of stomach pain. Even though this article focused on acupuncture, the results of this study help explain why other manual methods may produce beneficial results in patients. Acupuncture has been accepted to effectively treat pain related disorders by inserting needles into specific acupuncture points. Some practitioners connect these needles to an electrical current (electroacupuncture) or manipulate them by hand by twisting or turning motions. Pain, discomfort, and a sense of bloating in the upper abdomen were frequently reported by individuals with stomach disorders. In clinical practice patients will often describe an improvement in these disorders after completing a course of acupuncture. To cut a long and complicated article short, the authors placed a small balloon inside the stomach of an anesthetised rat. They also placed a probe into a part of the spinal cord which transmits pain signals to the brain, these pain signals were measured by the probe. To recreate stomach pain the scientists inflated the balloon by a small amount to distend the stomach and measured the electrical signals passing up the spinal cord. After inflating the balloon, an acupuncture needle was inserted into the right hind limb of the rat which corresponded to the acupuncture point for the stomach. After the needle was inserted a small electrical current was activated through the needle at different frequencies. The researchers discovered that when the balloon was inflated the pain signals through the spinal cord were elevated, indicating the rat was feeling pain. When the acupuncture needle was inserted and an electrical current was passed through it, the pain signals measured in the spinal cord significantly reduced. This demonstrated that application of electroacupuncture to the rats leg improved the rats stomach pain. This is important research as it demonstrates that electroacupuncture applied to a specific acupuncture point can reduce pain from an organ. 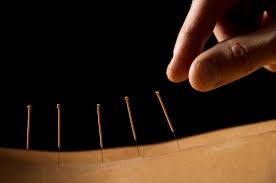 This helps us understand the mechanisms behind how acupuncture reduces a patient’s pain. It also helps understand how other manual therapies like Chiropractic and Massage techniques can improve a patients pain levels and perceived general health.